Dear reader, As the nation joins the rest of the world in observing 16 Days of Activism Against Gender Based Violence (GBV) – a period which also coincides with the World Aids Day and Human rights day, it provides us with an opportunity to highlight the momentous achievements the Patriotic Front continues to score in addressing the interrelated issues of GBV, HIV/AIDS Human rights and Women’s Empowerment. The PF recognizes that GBV is a Human rights issue just as it is both a Cause and Consequence of HIV/AIDS. Because GBV is rooted in traditional and cultural unequal power relations (social, economic, cultural, and political) between males and females, the Patriotic Front is mindful that to effectively deal with GBV, we have to deal with it from its roots. Consequently from the time the PF came into Public Office under the leadership of our founding father the late President Michael Chilufya Sata, and up to the present day under the leadership of his faithful successor His Excellency President Edgar Chagwa Lungu, the PF Government has embarked on a sustained multi-sectored and multi-disciplinary approach that seeks to effectively address unequal power relations between the Genders. The Patriotic Front set a new standard in attaining Gender equality and fighting GBV. Within the first six months of office, the PF Government of the late President Michael Sata upgraded Gender in Development (GIDD) from a mere department under Cabinet Office, to a full-fledged ministry- The Ministry of Gender and Child Development (MGCD). The formation MGCD was a master stroke of the Patriotic Front as the frontier against Gender Inequality and associated evils such as GBV was pushed back. 2011 also saw the enactment of the Anti-Gender Based Violence Act which represented a major step forward in the fight against GBV in Zambia. It still remains one of the most comprehensive laws on GBV in the SADC region and beyond. Under PF The Gender Policy has been revised and the Ministry of Gender and Child Development continues to be committed to protecting and promoting women’s rights, curbing gender-based violence and reducing gender inequalities by making progressive changes to legislation to strengthen the protective environment. As a brain child and product of the Patriotic Front, the Ministry of Gender has made tremendous strides in prioritising the advancement of women and strengthening their capacity to influence decision-making at all levels. The portfolio functions of the Ministry include coordinating and monitoring the implementation of: The National Gender policy; The Matrimonial Causes Act; and The Anti-Gender Based Violence Act No. 1 of 2011. Key to all of this is the Economic Empowerment of Women as well as the Prevention of Gender Based Violence and the multidisciplinary management of survivors. Under the leadership of President Edgar Chagwa Lungu, the PF Government paved the way for the enactment of, the Constitution of Zambia (Amendment) Act, of 2016 which, re-affirmed Government’s commitment to Gender Equality. The new constitution set out a new affirmative framework and the establishment of a Gender Equality Commission. Under the PF Administration, Zambian women have progressed exponentially in their participation in national affairs and decision making positions. That has enabled them to have the major say on their lives. Besides the standout appointment of Her Honor Mrs Inonge Mutukwa Wina as the first female Vice President of the Republic of Zambia, there are other women’s voices in the nation today that reverberate individually and jointly. They have hit high notes and pitches through positions of leadership and decision making across different sectors. The Patriotic Front Government has amplified women’s voices to levels they have never reached before. It is a given that the sustainable empowerment of women is significantly enhanced by their education. Under PF, School enrolment and retention for girls continues to soar. The Government has also scaled up the construction of Technical Secondary schools for girls in all the 10 provinces of our country. This development is targeted at stemming gender stereotyping of subjects and courses at secondary school and tertiary levels. Educational opportunities that enhance and promote the rights of the girl child, particularly in removing the impediments that inhibit their progression are thus being vigorously enhanced. Girls who marry as children are particularly at risk of violence from their partners or their partners’ families. The PF Government in 2013 embarked on an unrelenting crusade against child marriage through the launch of The Campaign to End Child Marriages. Since then, Zambia has made significant progress in reinforcing efforts to end child marriages. In recognition of the multifaceted nature of the child marriage challenge, the PF Government established a consortium of 11 Ministries to respond to the challenge. According to The Anti-Gender Based Violence Act, Child Marriage is a form of abuse which is derived from cultural and customary rites or practices. Gender-Based Violence and Women’s Economic Empowerment are inter-linked. The economic dependence of women on their spouses in many cases significantly renders them vulnerable to abuse economically, physically and emotionally. The PF Government through a number of government agencies such as the Ministry of Community Development has implemented various economic empowerment programmes such as the Social Cash Transfer to enable to women to have a respectable measure of control over their own finances. Although there have been a few administrative hiccups, the Social Cash Transfer has been a huge success in alleviating poverty among women particularly in the rural areas of our nation. It has widely been observed that an economically empowered woman is more likely than not to promote her children’s education, thereby breaking the scourge of trans-generational poverty and breaking the cycle of girl child economic dependency and GBV. Sexual and reproductive health and rights or SRHR is a human right applied to sexuality and reproduction. Gender-based violence and Sexual and Reproductive Health risks share a common root — gender inequality. It is a Health issue. Under the Zambia National Health Strategic Plan (NHSP) 2017 – 2021 being affected by the PF Government of President Edgar Lungu, the health sector has been implementing reforms aimed at improving service delivery. In order to enhance SRHR particularly for women, the Ministry of Health (MOH) under the guidance of the PF is creating demand for sexual and reproductive health services for women of reproductive age. The women of Zambia, the Patriotic Front and the nation at large is blessed to have a gender sensitive Head of State in President Edgar Chagwa Lungu. As our leader, his determination and steadfastness in matters of national development including issues of Gender Equality and the fight against GBV has attracted due recognition not only within our nation, but from many other quarters such as the African Union (AU) who his recognized his valiant efforts in empowering women in various spheres. The United Nations (UN) women not long ago appointed him as the promoter for the He-for-She campaign, which advocates gender equality. As we commemorate 16 Days of Activism against GBV as well as World Aids day and the International Day of Human Rights, I call upon all men to emulate the example of our Head of State in promoting Gender Equality. As a woman and a mother, I call upon all women to take advantage of the goodwill of the Patriotic Front Government led by President Edgar Chagwa Lungu, to advance the cause of the woman and the girl child. God in the beginning created a Man and a Woman and specified their roles in the family. This write up is a reflection of the Lesbian, Gay, Bisexual and Transgender (LGBT) Community Agenda that seeks to break the inherent musculin and feminine roles that God predisposed in the family unit and further tear apart the family circle. Zambia is a Christian Nation and as such they should uphold the biblical standard of Marriage and Family. The HeforShe project seeks to erase sexuality and encourage boys to be girls and vice-versa. I’m Not sure Mumbi Phiri wrote this. Lungu & his cronies had only 1 milestone when they came into power: to enrich themselves. They’ve achieved that milestone. Even if it means Zambians sleeping on empty stomachs & auctioning our country to Chinese. They have mansions in Lusaka, Dubai, Swaziland & Joburg. They stole through over-priced road & infrastructure projects & bribes & kick-backs from Chinese. Their kids, grand-kids & great grand-kids will never have to lift a finger or work yet our kids, grand-kids & great grand-kids will forever be in debt & all their taxes will go towards repaying the debt. Tasila, there is still chance to marry Prince Harry. HaLombe, this is the best posting I have ever seen you do. Don’t drown that real voice in you with fake news. Good job! I am PF but cant read the article. Please change the name of the author so that I can read it and benefit. I am UPND too and I failed to read! If they had put HH maybe I could have. Hahaha, when someone took the time to write for her! 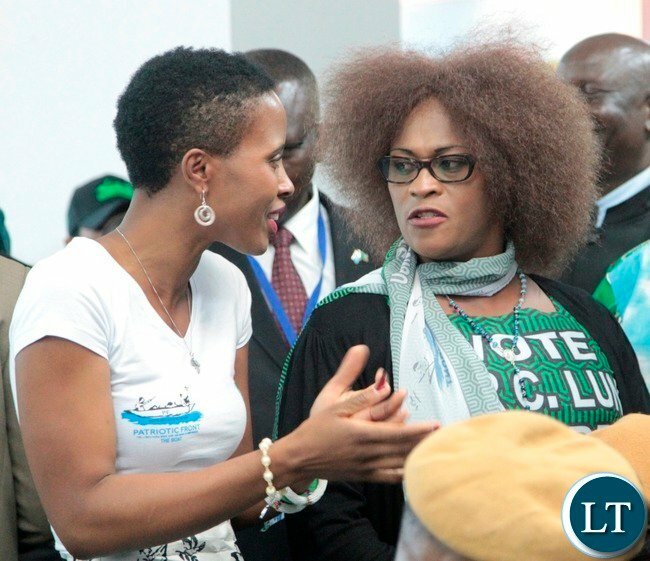 Mumbi Phiri can’t think deep! Just listen to her speeches in parliament then you will know what I am talking about. There is a word which is used in this type of writing where you append your signature to already written material and its called plagiarism. Fisheries and Livestock Minister Kampamba Mulenga Chewe yesterday inaugurated the new board of Livestock Development Trust at Keembe Piggery in Chibombo District. The Livestock Development Trust Board manages Palabana Dairy Training Institute, Mochipapa research center, Harmony farm and Keembe piggery under a private public partnership programme. The new board of trustees will be chaired by Lazarous Chota and assisted by Mukwandi Chibesakunda from NATSAVE Bank. The other trustees include Martha Chanda, Evaristo Chanda, Francis Mpulamasaka, Dr. Yona Sinkala and Dr. Benson Mwenya, according to ZNBC. TRIBALISTS. Just wondering how you arrived at this, “GBV is both a Cause and Consequence of HIV/AIDS.” The right word would have been ‘may’ not ‘is’. By any standards majority Muslim country have higher GBV which is in no way related to the HIV/AIDS pandemic. In other words, Muslim countries’ HIV/AIDS cases are always extremely lower than us despite their high GBV cases, it’s well documented. Poverty is the leading cause and consequence of HIV. The next leading cause is mis-education others explicitly say lack of ‘sexual education’. As a side note; the leading cause of mis-education is Gender related traditional/cultural values that don’t always favour our female folk. She even has the cheek to talk about this with a straight face…the bootlick her fellow drunkard Lazy Lungu…these people are so detached from reality its skin cinching reading such an article.